I grew up in a Portuguese/Japanese household where relatives often gathered to eat, drink, play music and dance. I was raised a Catholic in a Buddhist land. Hybrid Vigor offers a glimpse into my ethnic and cultural identity, and the continuing creative and spiritual experiences and insights that help shape my musical process. 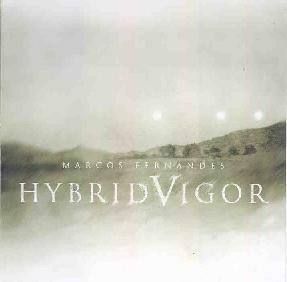 Percussionist/Improvisor Marcos Fernandes is the driving force behind the Accretions label and a founding member of the Trummerflora collective among other projects. His latest, Hybrid Vigor, is a roller coaster ride of avant-rock and jazz, free-improv, sound collage and artfully crafted freakiness. Helping Fernandes to create this primordial sound soup are numerous Trummerflora and other artists on electronics, synths, guitars, horns, and percussion. Tapes and samples made in San Diego, California; Kona, Hawaii; and various cities in Japan are a key ingredient on a few tracks and help to create the cross cultural feel that Fernandes is attempting to communicate. Among the highlights is "Science Boy", an intriguing blend of steady dancey ethnic percussion and freaky electronics that at times sounds like a War of the Worlds alien attack and at others recalls The Residents. "Undercurrents" is a slowly developing avant-jazz/rock tune with thudding percussion, a hypotic trance groove, a robotic brain throbbing bassline, and plenty more of the alien spacecraft freakiness that weaves it's way throughout the album. Much calmer is "Convergence", with its Eastern influences and highly thematic and image inducing quality that reminded me of many a scorching desert film scene. "Bullets For Ballots" is another track with a soundtrack feel, albeit a hallucinogenic one, with eerie mechanical keys, oddly collaged jazz with killer horn and piano runs, groovy ambient jazz bits, and samples of conversations in Spanish (or Portuguese?). And my favorite track is "The Orange Line" which includes lots of cross pollination that explores numerous rock, jazz and free-improv influences. The music transitions seamlessly from free improv chaos to killer funky spacey fusion grooves. Things get mucho acid funk rockin and totally freaked out as this 15 minute tune progresses and I want to cast my vote now for this to be the cantina scene music for the next Star Wars installment. In summary, I sometimes wonder about Aural Innovations' schizophrenic themes that cover both space rock and psychedelia on the one hand and avant-garde jazz, free-improv and experimental music on the other. It's albums like this that remind me that these worlds comfortably collide and that there's so much in both spheres that influence and [should] appeal to each other. Hybrid Vigor will easily make my best of 2002 list.